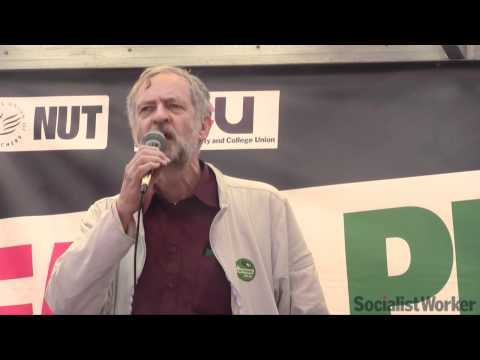 I have attended every UCU Congress since its formation and quite a few NATFHE ones too. But I have never seen anything quite like this one. Delegates witnessed remarkable scenes as staff walked out of Congress in protest at motions that had been placed on the order paper by the Conference Business Committee. One called for the General Secretary’s (GS) resignation (Motion 10) and the other to censure the GS (motion 11). The Chair suspended congress on three occasions. The staff union, UNITE, argued that the motions should not be on the order paper because the GS is a UNITE member and therefore the motions attack staff members terms and conditions. Congress was finally brought to a close on the last day after a third walk out by UNITE members when delegates voted for the third time to hear the motions. After this walkout a national official, whose title is, the Head of Democratic Services, (yep, you couldn’t make it up! ), finally announced that congress had ended. The anger of the majority of delegates was palpable. Members who had given up their holidays, had arranged cover from their work places and organised child care were seething about the quite blatant attempt by the GS and the Senior Management Team (SMT) of UCU to block Congress from debating motions 10 and 11 on grounds of an employment issue. Congress quite rightly rejected (see statement) the assertion made by some of UCU paid officials, that if Motion 10 and 11 were passed, it would leave other employees of the union vulnerable to similar motions. This is a complete red herring. The GS is an elected officer of the Union whilst others aren’t. Delegate after delegate made it clear that they have the upmost respect and praise for the hard work our UCU paid officials do. But they cannot allow UCU elected officers being given a bullet proof vest to shield them from any criticism. The majority of Congress supported those who argued that it is a fundamental democratic principle of trade unions to be able to hold their democratic elected leaders to account. If Congress had supported the call not to discuss these motions it would have agreed to give the GS a veto over any motions that criticised her. This is an unsustainable position for any trade union to hold. Before this intervention by UNITE members of the SMT and the GS most delegates probably would not have supported motion 10. Many HE delegates, whilst unhappy with the GS’s role within the USS dispute, would have more likely voted for the censure motion. They believed that after a 64% to support the GS in suspending action in the USS dispute would members would view delegates support for a motion calling for her resignation as undemocratic. The GS and the SMT intervention changed this view. The mood changed. Delegate after delegate said ‘I was not going to vote for this motion but I am now.’ The debate was no longer about the censure or resignation of the GS but had become about democratic controlof UCU. Was this held by elected representatives at the sovereign body of UCU or the unelected full-time officials? Arthur Scargill in 1983 faced a motion of no confidence brought by the right wing within the Miner’s union from the Nottingham area NUM. Scargill responded by touring the country and winning support for his leadership. At the NUM conference that year Scargill defeated the no confidence motion and instead delegates passed a motion of confidence in his leadership! Why didn’t the GS argue her case or defend her position? It was strange to see the GS on the podium not making one attempt to defend her position or speak to win Congress to oppose the putting of these motions. The only time she did speak was to give her address which did not mention the raging war taking place in Congress. Why did the GS and the SMT of UCU allow the situation to spiral out of control? The simple answer is because for them it was an attempt to reassert the control of the full-time machine over a newly resurgent rank and file within UCU. At Congress this year a new UCU could be seen. UCU is in transformation after 16,000 new members joined after the magnificent USS dispute and the campaign of 15 FE branches over pay and conditions. Remarkably a motion to support the findings of the Commission into effective industrial action, one of the very view motions that was discussed at Congress, was passed unanimously. At the centre of the commission’s recommendations was the need to put escalating sustained national strike action as the main weapon in UCU’s armoury to defend post 16 education. In the sector conferences, which went ahead without disruption, both passed motions unanimously to ballot members over this year’s pay claim. The FE sector conference heard delegates from branches, that have been viewed in the past as not militant, coming forward to explain how their members are up for a fight over pay. It is this new mood of confidence and militancy that lay at the heart of the split within the union. The GS and the SMT are for more strike action over pay and conditions. It would be wrong to simply characterize this argument as between those who want an organising union against those who want a service based one. Whilst this may be true of some of the GS supporters in the Independent Broad Left (IBL), it isn’t true of her. The GS recognises the need for national and local collective action to win results. But believes this action must be bureaucratically controlled by the GS and the full-time apparatus and not the rank and file. The #nocapitulation moment outside UCU HQ when the GS attempted to finish the USS dispute and hundreds lobbied the NEC and thousands across the country held mass meetings organised by newly formed college-based strike committees in response to this attempt, sent the GS and the full-time machine into panic. The genie of independent action by the rank and file within UCU had been let out of the bottle. It is this that all GSs of trade unions and their full-time staff are most afraid of. UCU had its second #nocapitulation moment at Congress. It was inspiring to see delegates leap to their feet to argue to stay in the hall and debate how to respond, after the Chair formally suspended Congress business. Observers were elected as tellers, statements were written on the hoof and voted upon and positions formed in an open and democratic way without an official in sight. Over half the delegates remained in the hall to participate in this new experiment in rank and file democracy. It was bizarre to see a minority of delegates, led by supporters of the IBL, leave the hall and set up a support picket chanting and writing posters in support of ‘paid officials’! It is this that explains why the GS and the UCU SMT were prepared to go to such lengths to deny Congress to hear these motions. The question now facing UCU is simple. Does it move forward to fully embrace the 16,000 new members who have brought into UCU a new and dynamic creativity to the union or does the old bureaucratic and top down methods of stifling debate and creativity maintain business as usual? If the old methods succeed then UCU will go backwards. Thousands of new members will leave and with them any possibility of transforming UCU into a really powerful force that employers are petrified of. This is why we cannot allow this to happen. If the new democracy from below movement is to be successful it must link itself to the struggles of UCU members. The life blood of rank and file democracy is activity. Without the national action over pay and pensions this life blood will be cut off and passivity will follow. Every branch in every college and university must meet to pass a motion that supports the sector conferences decision to ballot over pay. The branch should also support the late motion passed at Congress to reaffirm Congress’s right to hold our nationally elected officers to account which means allowing motion 10 and 11 to be debated at a re-call Congress, alongside the other motions that were not discussed. The statement by the majority delegates and their signatures has gone out on the @OurUCU twitter account. 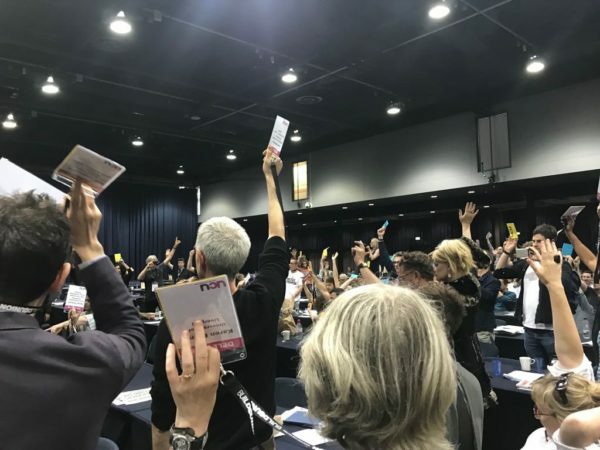 At a meeting on Wednesday evening, delegates voted to meet this Saturday at a meeting hosted by the London Region of UCU to debate where we go next. Activists should get to that meeting if at all possible so we can co-ordinate the fight for democratic control of our union. UCU has gone through an incredible year. It has put back on the map for the whole trade union movement that unions can get their members to support national ballots for industrial action and by so doing demonstrate that sustained strike national action is not only possible but can win. But for trade unions, and UCU in particular, to be able to continue to build on this success then leaderships must allow rank and file voices to be heard – no matter how uncomfortable these voices, on occasion, might be. Sean Vernell UCU FE vice chair and congress delegate. I agree very much that we let rank and file members voices be heard. My concern is that UCU Left is perhaps not so interested in rank and file membership democracy as in delegate democracy. Are you really asking that the rank and file be involved? Generally speaking, rank and file means everyone, rather than a self selected group of politically aligned activists who get selected as congress delegates and try to impress their minority views on the whole union… If we are truly committed to democracy, and with the aid of technology, direct consultation with the entire membership is so much easier now, then this is the way forward. I couldn’t think of a quicker way to alienate new members (and indeed the bulk of existing members) than by making claims about the views of union members which are invariably not backed up when the whole membership is asked/consulted. I’d be intrigued to know the result of any vote by the whole membership on Sally Hunt’s continuance as GS. What I do know is when the last election took place and the whole membership was consulted, she comfortably beat the UCU Left candidate. It seems to me that the core of the disruption to Conference lies in a real or suspected incongruity between UCU’s constitution and employment law. Something very similar happened in a voluntary organisation I knew about 30 years ago, so it is not a new risk and perhaps should have been foreseen. In that case, a member of the head office staff had been dismissed and activists tried to use conference motions to get them reinstated. It became clear that the organisation’s national council was the employer in law. This made sense as it is in principle unfair that an ordinary employee should be answerable to a body which assembles for one weekend per year, consists mainly of people with no expertise in HR practice or employment law and which due to the transient nature of it’s membership cannot be sued (e.g. for unfair dismissal). However it is certainly right in principal that any democratic organisation should be able to exercise control over it’s most senior leaders. Many voluntary organisations get round this by having a management committee of unpaid delegates supervising the senior employees. However a union on our scale is too large to be centrally managed by volunteers. It is possible to find workable solutions to this conflict and it is most regrettable that UCU did not do so before the potential problem built into it’s procedures became real. In this case it seems to me that the GS being elected by the membership, but now being criticised at Congress, is a major factor. As UCU now operates, Congress cannot be relied upon to fully reflect the opinions of the membership (mainly due to many members apathy, true, but still the case). This does raise the legitimate question of the extent to which Congress (as a body, rather than individual delegates statements of opinion) should be able to question appointments made by the membership.